In Houdini, edges are normally treated as undirected and shared between faces. However, for some tasks (such as simplifying or cleaning geometry) it is useful to view faces as each having their own edges. Each half-edge is directed (it has a start vertex and an end vertex). The half-edge functions let you quickly find a half-edge’s source and destination vertex, the next half-edge, get the other half-edges from the same edge, find all half-edges sharing a given point, and other manipulations. Two half-edges are equivalent if they are "split" from the same shared edge. In the following figure, three primitives share an edge. 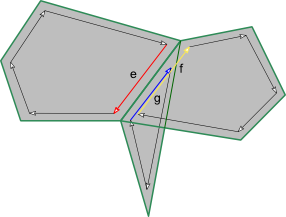 The half-edges e, f, and g are equivalent because they are from the same edge. Directionality does not matter – e is considered equivalent to f and g even though they have opposite directions. 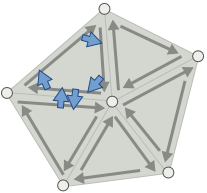 The source (and destination) vertex of a half-edge uniquely identify it, meaning that there can be at most one half-edge with a given vertex as the source. This is because a vertex can belong to only one primitive. 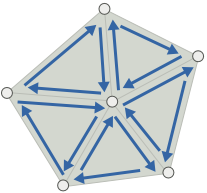 However, because several vertices can be wired to the same point, half-edges can have shared source and destination points. 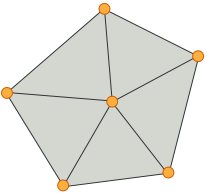 Another way of thinking about equivalence is that two half-edges are equivalent if their vertices are shared by the same two points. One of a set of equivalent half-edges is considered the primary half-edge in that class. The VEX functions let you check if a given half-edge is primary, or given a non-primary half-edge, find the equivalent primary half-edge. In the case of an unshared edge, it only has a single primary half-edge. Find the primary equivalent half-edge. If it belongs to an unshared edge, then the same half-edge is returned.